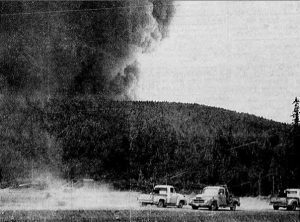 An article on August 11 portrayed the Grove fire as an “ugly calling card, a blackened waste”. The description of the aftermath of the Grove fire on Tabor Mountain described the earth as “scorched down to sub-soil, with its colour as grim and lifeless”. The trees were described as “gaunt, shriveled remainders of what once were stately trees sticking forlornly into the air or leaning exhausted against each other”. The fire described as “death having ravaged the land like a plague”. The fireguards represented “reminders of man’s futile efforts against the raging inferno.” The total area affected (see appendix 1 for maps of the fire area) by the fires covered 35,389 hectares (ha), which included 23,393 ha by the Grove fire and 11,996 ha by the Tsus fire. Since 1961, efforts to re-establish new forests undertook various forest management strategies. The resulting improved access to the area saw the growth of recreational groups with new cabin developments in several locations. Recreational activities increased with strategies to establish Tabor Mountain as an area focused on recreation, which government would not formally recognize. During the 1960’s and through to the 1970’s ski enthusiasts developed trails and cabins throughout the mountain. As seen in the pictures taken from the Prince George Citizen 1967 (see below), ski activities took full advantage of the Mountain. In 1967, success for recreational groups of Tabor Mountain, specifically the Hickory Wing Ski Club, successfully hosted the only sanctioned international cross-country ski championship races occurring in North America. 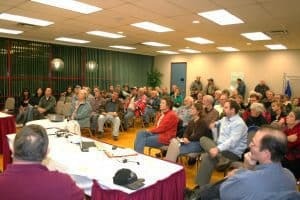 It was not until 2006 when a conflict between recreational users on Tabor Mountain was brought to the attention of the new government Forest Recreation program which is now Sites and Trails B.C. within the Ministry of Forests, Lands, Natural Resource Operations and Rural Development. The matter was taken very seriously and government provided a solution to the conflict as well as a new approach and vision for the recreationists to buy into. The ultimate goal became to have all of the existing recreation groups using the mountain to become part of an umbrella Society which will ensure everyone can practice their recreational activities in a harmonious way and will allow for better integration of the planned future maintenance work to be performed on public designated trails by government. The Tabor Mountain Recreation Society (TMRS) was created in 2008 and was made of nine recreation groups and had a total of 3427 members. In 2011, after three years of community awareness campaign and tremendous cooperation between Government and TMRS, the legal recognition of the largest trail system in B.C. (407 Km trails and 27 new recreation sites) was sealed under a Ministerial Order designation signed by the Assistant Deputy Minister Gary Townsend. Following this enormous accomplishment, Sites and Trails B.C. immediately entered into a Partnership Agreement with TMRS and recognizes that Society as the primary volunteering organisation which will provide assistance to government in the maintenance of the public trails. Since 2011, further organization, planning and project development have been occurring on the mountain. Between 2011 and 2017 alone, TMRS volunteers have provided an estimated 15,000 hours of work, received $278,470.00 in donations from several local supporters and spent over $1,300,000.00 from diverse sources of funding. TMRS is welcoming new individuals or groups to become members of the Society and share our passion in making the mountain a wonderful place for people to practice their recreational activities.